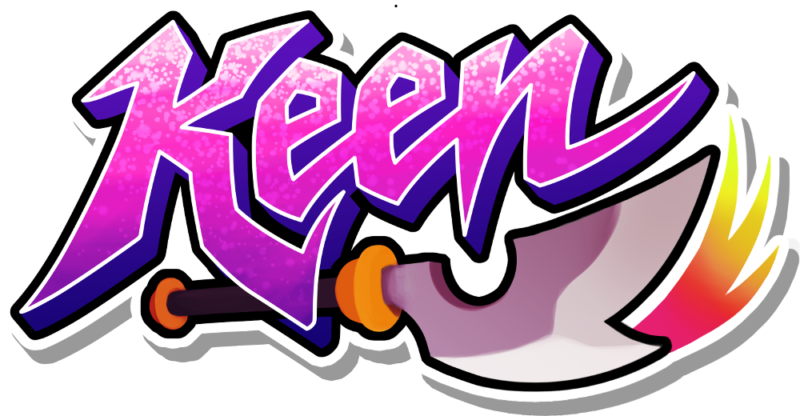 Keen is a sliding puzzle game feature combat elements. You play a character that slides across the room, while enemies move a single space at a time. The player has no way to end their movement early, except by running into something. Thus, moving north means the character will always move as far north as possible. The challenge comes from trying to slide into the right position, without opening yourself to a counterattack. Movement is turn based, as all enemies on the map move immediately after the player does. The baddies only move a single space at a time, which allows you to corral them. However, because the player slides everywhere, it can be difficult to confine the enemies into an ideal location without counterattack. You primarily defeat enemies by slashing through them. Slashing requires a space on the opposing side of the enemy; i.e., if an enemy is to my right, then I need an empty space to the right of the enemy. When a free space is unavailable, then you will perform a slam attack. A slam attack does less damage than a slash, but will stun nearby enemies, preventing them from counterattacking. The game was a blast, and quite challenging. Check out Cat Nigiri on the webz for more details, and listen to our audio interview below!